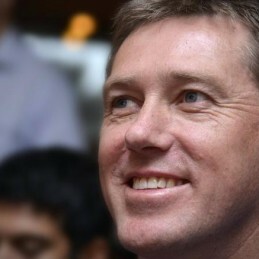 Glenn McGrath is one of cricket’s most decorated players and the chairman of the McGrath Foundation. Glenn and his late wife founded The McGrath Foundation to address the shortage of breast care nurses in Australia, particularly in regional Australia. The foundation has helped countless lives of Australian women battling breast cancer. The foundation has 54 McGrath Breast Care nurses and since 2008 has placed an additional 46 nurses. Popular with crowds and a highly respected athlete, McGrath’s strength of character and on-field success made him an instant success in the media following his retirement. In 2008 and 2010 he was named as one of Australia’s most trusted people. McGrath has taken the most wickets of any Australian fast bowler and is also fourth on the all-time Test wicket records. He was the first Australian bowler to play 200 one-day internationals and also the first to play 100 Test matches. At the end of 2006 McGrath announced his retirement with the fifth Ashes test in Sydney his last and the 2007 World Cup his last one day appearance. Glenn played in the Indian Premier League Twenty20 competition with the Delhi Daredevils in 2008 and 2009. In 2008 Glenn was honoured as a member of the Order of Australia for service to cricket as a player. Later in the year he would also receive recognition as the New South Wales Australian of the Year for his contribution to cricket and his dedication and service to the McGrath Foundation.